What are the best times to trade Binary Options? - Find the best Binary Options Brokers, Binary Options Bonuses, Binary Options Signals, Binary Options Software and everything Binary Options related on Binary Options Directory! These images do not show every market in the world but these are the major ones. The Canadian market is open while New York is open and London overlaps with other European markets. Germany opens one hour before London; so some think that to be the open and not the start of the London session. 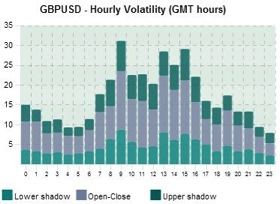 Volatility on average does not see a marked increased until London opens though. 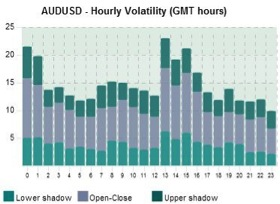 Those major sessions directly impact currency pair volatility. The images below Show you hourly volatility. If your strategy is based on volatility or you are using a trending strategy focus on day times where the price moves are largest. The “spikes on the chart” are excellent times because the price needs to be making higher highs or lower lows in order for volatility to increase during that time. If you are using a range trading strategy or prefer low volatility you should trade during the sedate times where the charts show decreased hourly volatility. All images below are current as of January 9, 2014. These charts are providing a good overall context for relative intra-day volatility. 8 to 17 GMT provide the best trending opportunities. At 13 to 17 are the biggest moves. 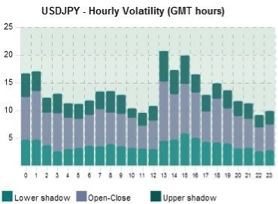 Those seeking reduced volatility or times which are more likely to quietly range you should trade between 20 and 5 GMT. 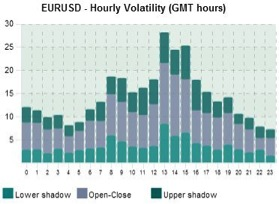 The USDCHF is very similar to the EURUSD in terms of its hourly volatility structure. The NZDUSD has very similar hourly volatility like the AUDUSD and they both move roughly the same amount each day. Learning the Basics like as what the market sessions and hours mean to you as a trader can significantly help you in determining what strategies to use and when. No matter what timeframe you are trading on you should have a checklist that helps you to determine what type of market environment you are trading in. This will also help you to filter trades.